Click here for general event information and a welcome letter from the local hosts. 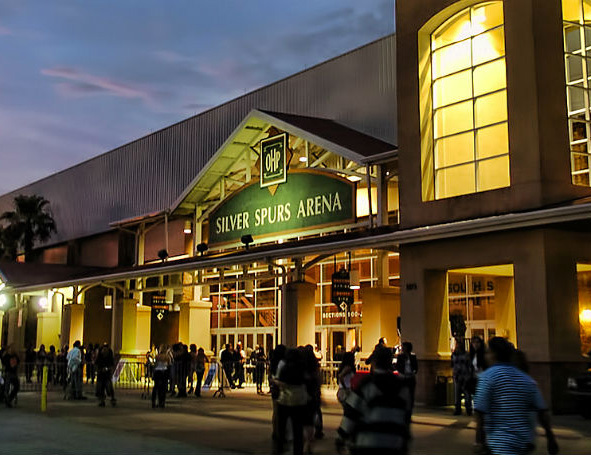 Admission Tickets will be available for purchase at the Silver Spurs Arena Box Office. All gymnasts and coaches who qualified for the 2019 Eastern Championships will be provided credentials for the weekend. All athletes who have qualified to JO Nationals or Eastern/Western Championships MUST link to the following web site to complete their bios. These surveys are used by USA Gymnastics for information and promotional purposes, including posting pictures and bios of the winners. The National Championships Meet Hosts may also use these bios to publicize human interest stories about the athletes. Most importantly, it allows us to provide information on the high school-age athletes to the NCAA* coaches in attendance. Even if you are already signed with a university, we are asking you to complete the survey, as it’s important that the collegiate coaches are aware of who has already committed to a university. No information will be accepted after this date. * Information about all high school–age athletes will be distributed to the NCAA coaches in attendance. Any information regarding GPA, SAT/ACT scores, as well as personal information such as addresses and phone numbers will be considered confidential, and will only be given to accredited college coaches. The 2019 USAG Level 9 Eastern Championship Athlete Welcome Party will be hosted at one of Orlando’s premiere entertainment venues Drive Shack! Drive Shack is a multi-level golf entertainment destination where players of every slice or fade can kick back, kick it up, or kick aside everything they know about golf. It’s the place to play the game your way, with a group of friends of all ages, or just hang out! From experienced golfers to those who don’t spend any time on the greens, there’s an interactive game or friendly competition for everyone – no matter your drive! Please see below for further event details on the upcoming event. If you have any questions, please feel free to contact Wesley Wilson. A memorable program book is being prepared specifically for the 2019 USA Gymnastics Level 9 Eastern Championships. This commemorative book will contain competitor’s names, participating gyms and states represented as well as meet schedules, rotation sheets and officials. You will not want to miss the opportunity to wish your gymnast “Good Luck” and/or promote your business to those in attendance. This program will be viewed by hundreds during the meet weekend and saved as a keepsake by many! Each paid ad will also receive a complimentary copy of the 2019 USAG Level 9 Eastern Championship Program, (to be picked up at the meet). An order form is attached so that your facility/booster club and/or parents may place an advertisement or personal message of encouragement for their gymnast. The size and prices of the advertisements are outlined on the order form. Artwork or pictures may be emailed, in PDF, or JPEG format or sent along with the order form to the following address. Again, thank you and congratulations on making it to Easterns. We look forward to meeting you and helping you promote and encourage your teams and gymnasts in 2019 USAG Level 9 Eastern Championships program. Click here for discounted tickets to local attractions.